Like many young women, U.K. student Madison Brownley, 18, just wanted to go on birth control to help with her acne and regulate her period. She had no idea that doing so would cause her to begin a lifelong battle with her health as a direct result. After taking the pill, Brownley experienced a near-fatal blood clot, which unfortunately is a serious potential side effect of oral contraceptives. According to the National Blood Clot Alliance, every year 1 in 1,000 women who are taking birth control pills will develop a blood clot, though it can be significantly higher if you have thrombophilia or a history of thrombosis. Karen Elizabeth Boyle, MD, FACS, after reading about Brownley's case, reiterated these risks: "Taking oral contraceptives definitely increases the risk of developing a blood clot by up to fourfold, even in a young, healthy woman. Some of the newer OCPs also carry a greater risk than older versions of the pill due to the different type of progesterone used in these pills." Cosmopolitan spoke with Brownley to find out what it's really like to have your birth control threaten your life. I started taking oral contraceptive pill Dianette in November 2013 when I was 16 to help with my acne and also to regulate my period. When they first give you the pill, they also give you a packet of information and tell you to read all of the potential side effects, but you never really do. The doctors also asked me if my family had a history of blood clots, but I had no idea if they did, so we just moved on with the other questions. I wish I'd known how important that question was. About two months after I had been taking the pill, I started getting backaches and it hurt to sit down. I just assumed those were normal side effects. Then in February 2014, I got in the shower and noticed my leg felt quite tight and I felt faint. A few minutes after that, I saw that my leg had turned blue and my toes were purple, and I knew I had to go to the hospital. The doctors realized right away that the issue was a blood clot because the blood wasn't pumping around to where it should have been. They gave me a heparin injection, which is a blood thinner, and tried to do an X-ray on my leg to look at the clot. They also transferred me to a bigger hospital that would give me better care. Once I got there, I was put on an anti-coagulation medicine and told that over time, the clot should just disappear and break down on its own. Unfortunately, after the ultrasound scan, they noticed the clots were a lot more extensive than they thought. They told me they could do a treatment called thrombolysis, where they blast the clot with a chemical, but they thought that might be too risky, so they didn't end up doing it. But then over the next week, it became even more painful for me to walk, so they did a CAT scan and realized it had gotten bad enough for them to go through with the thrombolysis treatment anyway. I was in intensive care while they put a catheter into the back of my knee and blasted the clot with sodium chloride solution. They also had to put a filter in my neck to prevent the clot from going up into my lungs, which would be very dangerous. And to make matters even worse, we couldn't do it under a general anesthetic because they needed to know that I was responding during the procedure, so doing all of that under a local anesthetic was quite painful. They also had to constantly take X-rays during that time and one of the X-rays showed a blockage in the main vein that takes the blood back to the heart. As the main passage back to my heart is blocked, smaller veins and vessels have to instead transport this blood round to the heart (they explained it to me like a motorway—if a large motorway is blocked, traffic is diverted along smaller roads and so the roads become much busier). As these smaller veins weren't used to high blood flow, they didn't have as high a capacity, and so blood takes longer to get back to my heart than it would if it just traveled up the superior vena cava (the one that is blocked). In total, I was in the hospital for 17 days. I was only discharged once I had restarted anti-coagulation medicine and the thickness of my blood was at a stable level. Immediately after being discharged from hospital, I started having breathing problems when I exercised, and would feel light-headed and faint easily. Once I saw a cardiologist, he told me that this was because the blood still was not circulating around my body properly. The only thing I can do to tackle this is to try to naturally increase the size of these veins by exercising and regularly increasing my heart rate. I was told that this should take several years. That was also when I found out that I had a protein C deficiency. A protein C deficiency can increase the risk of developing blood clots, so that was when doctors came to the conclusion that the blood clot was likely caused by a combination of my protein C deficiency and the birth control I was taking. Because I didn't know I had the deficiency when I started the pill, I had no idea that the pill could increase my risk of abnormal blood clots. I remember them asking me about blood clots running in my family and mentioning them as a possible side effect, but I didn't know what would happen if I got one. So when they told me that my health problems were being caused by a blood clot, I honestly had no idea what was going on. My doctors later told me that when you're on the pill, it can cause your blood to clot more easily, so combining those two factors really affected my health in an extreme way. I also had no idea that Dianette was suspended in Canada for a short period of time because of concerns about blood clots. At the time, all of the health problems I was having were shocking because I thought having problems like that with your birth control pill were supposed to be so rare. I felt pretty unlucky that all of this happened to me, since most people take the pill and it just helps with their periods and with their skin. I was also doing my A-level exams at the time, so I just really wanted to be in school instead of in the hospital all the time. Once I was finally discharged from the hospital, I was told I'd have to keep taking anti-coagulation drug called warfarin every day for the rest of my life. I'd also have to have blood checks every two to three weeks for as long as I'm on warfarin, which I still do. I'm hoping one day there'll be a drug I could take as an alternative to warfarin so I won't need regular blood checks along with it. Because of everything that happened, I can never go on any hormonal birth control again, which is annoying because my period is still irregular and I have to use a [non-hormonal] IUD for birth control. In a way, I don't regret taking the pill because that's what caused me to realize I had this protein C deficiency and it's kind of better that we discovered it now. 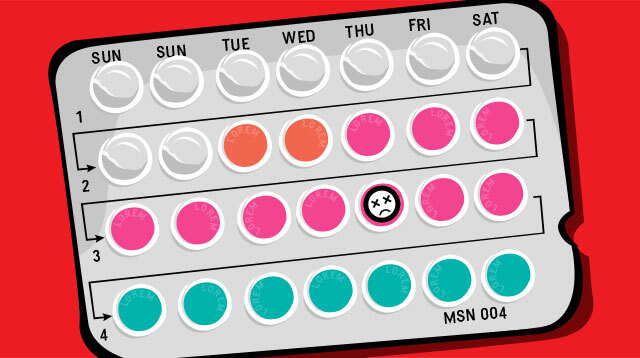 What annoys me the most is the fact that there aren't more ways to check and see if you're going to be OK while taking the birth control pill. Ideally, there would be a way to have people take blood tests before they go on the pill because it seems to me like these problems are more common than people think.